I'm slowly turning in to my mother. This realization both comforts and frightens the heck out of me. See, I've begun to notice that like my mother, I now save the choicest morsels for Little Man, I no longer freak out when clumsy hands shatter my favorite dish, and I look forward to afternoon chai time all day. I fear that the transformation to full-on Pakistani aunty'ness, complete with the soap opera watching and the hours of phone chatter about absolutely nothing, can't be all that far behind. Like I said, it's terrifying. The event that triggered the realization that I'm becoming my mother's clone? Why that'd be leftovers. Allow me to explain. When we were growing up, my mother would save the leftovers from a few dinners and when she had a leftover pile that she was content with, she would declare a random night of the week to be a Leftover Party dinner. You never knew when it would hit. And just in case you had any doubt, adding the word party after the word leftovers does not actually make it a party. My brother and I hated Leftover Party night. Inevitably, there'd be one thing on the table that you didn't mind eating again. But it would be surrounded by three of four things you absolutely refused to eat again. So you either had to be fastest to the draw in grabbing the item of choice, or you'd be stuck with an entire meal of leftovers you despised. In becoming my mother, I recently I realized I've begun to like leftovers. Maybe even, love leftovers. See, having leftovers means the Hubster and I can bring a lunch to work that consists of real food and that we don't have to run out for a burger come lunch time (but running out for an afternoon snack of curly fries is still totally permissible). Having leftovers also means not having to worry about dinner on Parenthood, Big Bang Theory, or How I Met Your Mother nights. 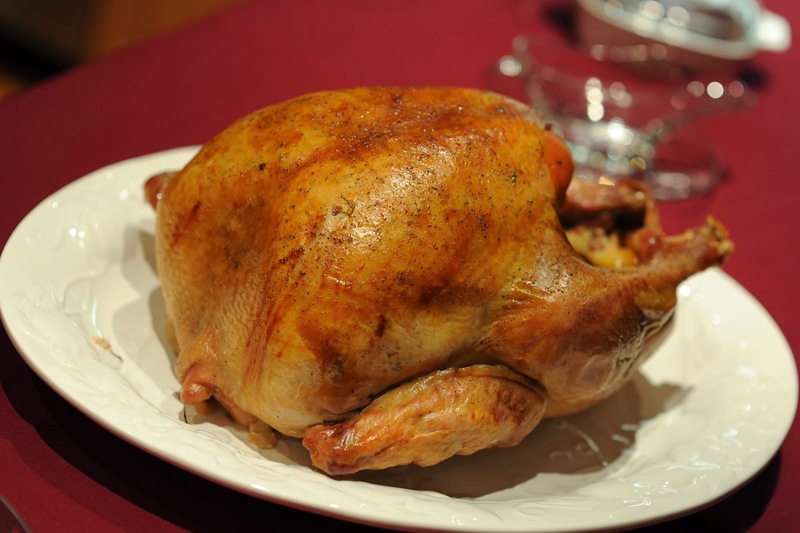 This year, we were blessed with an abundance of Thanksgiving turkey. There was, of course, the 12-pound "practice" turkey that I made the weekend before Thanksgiving. Then, there was the giant 22-pound bird I made for Thanksgiving. And if the leftovers from those two birds weren't enough, we somehow walked out with a giant plate of leftover turkey from a Friendsgiving hosted by some friends. And even staring into a fridge filled with nothing but tupperwares of turkey, I had the genius idea of suggesting I make a third turkey just so I could perfect my turkey technique. Luckily, the Hubster put a kaibosh on that plan rather quickly. Faced with a massive pile of turkey leftovers, we made turkey sandwiches, and turkey pot pies, and a turkey version of this stroganoff. And still, we were left with a lot of turkey. A lot. And all of a sudden, the weather in San Francisco changed to actual winter (well, West Coast winter, at least). Heck, one day, it was 36 degrees. That's real live winter, folks. And more importantly, it's soup weather! 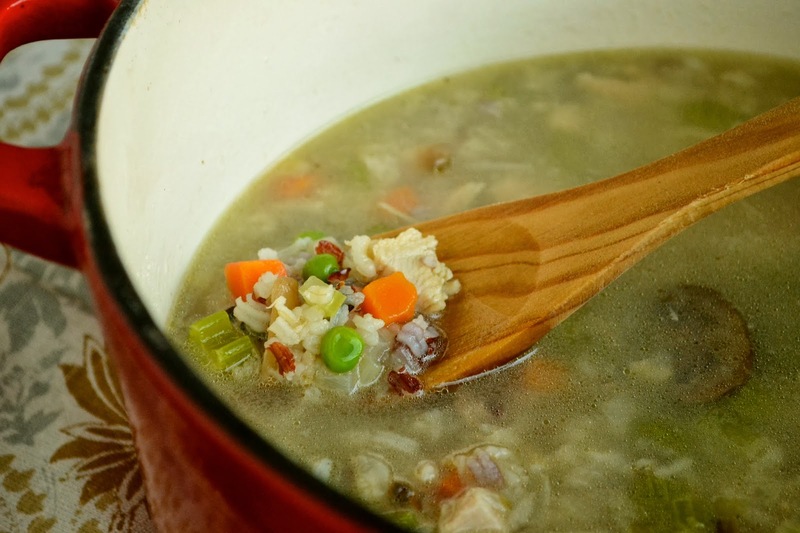 And so, we busted out a precious container of homemade turkey stock from the freezer and made Turkey and Wild Rice soup filled with fresh vegetables, hearty rice, and most importantly, plenty of turkey chunks. On day one, I ate that delicious soup straight up. On day 2, I doctored it up with a heavy squirt of sriracha, lime juice, and a sprinkling of fresh cilantro and slurped it during a work lunch meeting. There may have been some envious glances and I'm guessing it wasn't because of my less than stellar combo of heavy white cotton socks and high heels. We still have a few servings of soup left and you know what that means, leftovers! And now that I've accepted that I'm turning in to my mother, I'm guessing my obsession with Pakistani soap operas is not that far behind. Melt butter in a heavy-bottomed stock pot. Add onions and saute until translucent. Add remaining vegetables and cook on low heat until vegetables soften. Season the vegetables with salt and pepper. Add the wild rice and cook for 5 minutes, stirring regularly. Add chopped turkey, stock, and garlic powder. Bring to a boil, then reduce heat and cook on a low heat for 45-60 minutes until wild rice is cooked. Season with salt and pepper. Congrats on the transition. It happens to all of us.What's funny is the one thing that you do that triggers the realization. For me it was using vegetable odds and ends to make soup. I thought it was my own idea, but as soon as I tasted it, I knew it was mom's. I have about a gallon of turkey stock sitting in the freezer right now, just waiting to be used. Thank you for finding that use for me. The Mom Chef, I'm so glad you too have homemade stock! That stuff is gold and it's so comforting to know you have it in the freezer, ready for all sorts of meals! Lol, don't fret, I've been my mom for years. He he. I thought I had a bunch of turkey to deal with, I think you have me beat. One of my favorite things about the dinner is being able to made turkey soup afterwards. Hope you guys had a great Thanksgiving, can't believe Christmas is right around the corner. So well written. It did make me laugh, don't worry we all feel the same. Well, the soup looks hearty and good though. Great job with the leftovers though. I am totally with you my friend. I LOVE leftovers. I make so few things that I have to make large quantities so they last. My family tries to argue but I just give them a look and they usually stop. And you are such a nice person that I know you had the most fabulous mother. Turning into her is a fantastic thing! How i agree to you even i always think i am like my mom now espcially when i worry aobut my daughter and i remember mom saying to me when i was a teenager and living at home you will understand me when you bacome a mother and i agree to her in that now. And i have told her that too years ago and she just gave me that knowing smile. I have my turkey carcass in the freezer and will soon make soup just like my mother always did. Your version with the wild rice and mushrooms is different from mine, but I think I'll have to give it a try! And I agree, leftovers are a wonderful thing!! Haha - I do love leftovers too - but my daughter might not be as big a fan of them as I am! I love leftovers nowadays (less time in the kitchen on busy nights! ), but I can see how those "party" nights were dreaded when you were a kid. I love the description of you and your brother fighting over the choicest leftovers - those must have been some interesting dinners! 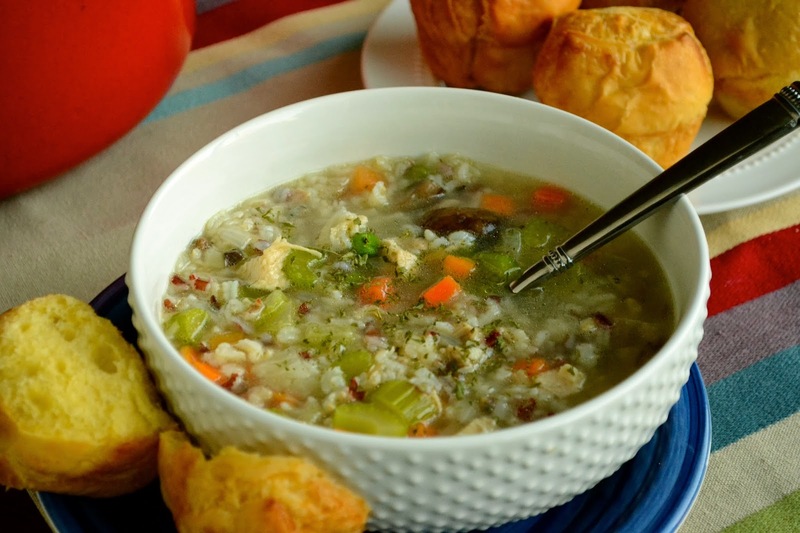 ;) This turkey and wild rice soup looks amazing and a perfect use for leftovers! P.S. I think I may have to start an afternoon chai time. My mom makes a very similar recipe to this. She calls it turkey gumbo. And like you, I'm beginning to love leftovers as much as my mom does! Thank you for sharing! A bowl of this sounds so very good! LOL I love she called it left over party night! We have left over night, sometimes its stretches to TWO whole days [of, errr, partying]. It's amazing how we can see glimpses of our parents in how we behave.